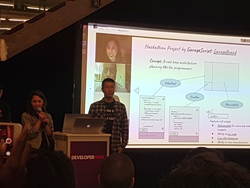 DeveloperWeek 2018 SF BAY AREA was a great event for MyScript. 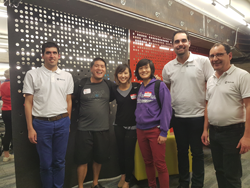 For the first time, we directly sponsored an event targeted at developers. With the recent availability boom of high quality, handwriting-enabled devices like tablets with active styluses, we felt it was the perfect time for developers to build mobile and web apps leveraging handwriting at the core of their user interface and to see what we could learn along the way to improve the developer journey. The Sink – On-device challenge, 1st prize: The proposal leveraged Apple’s ARKit to let people measure their kitchen and order cabinets and other appliances. We loved how the integration of iink SDK text blocks made “in context” annotations possible, right on the augmented image, without the hassle to pop a keyboard. 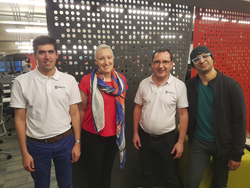 Flowcode – On-device challenge, 2nd prize: The team proposed an innovative visual approach to programming, where iink diagrams let users create flowcharts that were then converted into code and run. Nihao.there – Cloud challenge, 1st prize: A very neat integration of iink SDK text cloud recognition in the context of learning Chinese, a language that particularly benefits from the ability to handwrite. 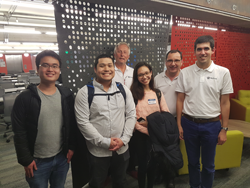 Doodle Design – Cloud challenge, 2nd prize: The team demonstrated a promising way to use MyScript shape recognition to sketch software user interfaces and turn them into ready-to-use professional mockups. 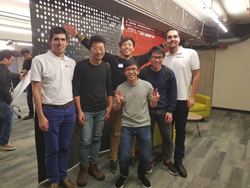 On top of that, Garage Board, the winner of the overall Hackathon prize, developed a real-time shared board prototype using MyScript shape recognition technology. 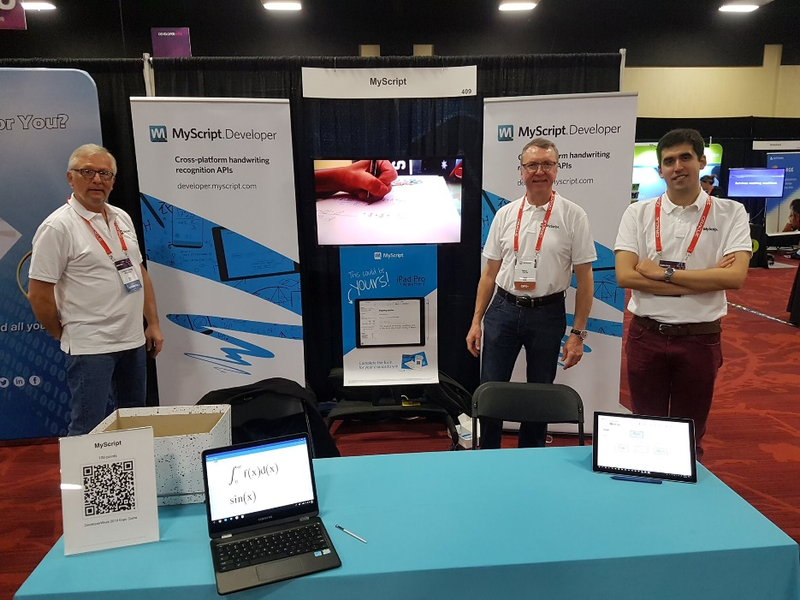 MyScript was also sponsoring the 2-day conference and exhibition on Feb 6-7, which gathered more than 6,000 developers from all around the world. It was the opportunity for us to present our brand-new Interactive Ink SDK 1.1, both within mobile applications like Nebo and Web applications. These two days were very intense, with greater than 300 people stopping by our booth to discuss digital ink management. We received a lot of positive interesting feedback. The daily drawing for an iPad Pro with Apple pencil was also quite an event, large crowds of people arrived at MyScript booth to see the outcome. 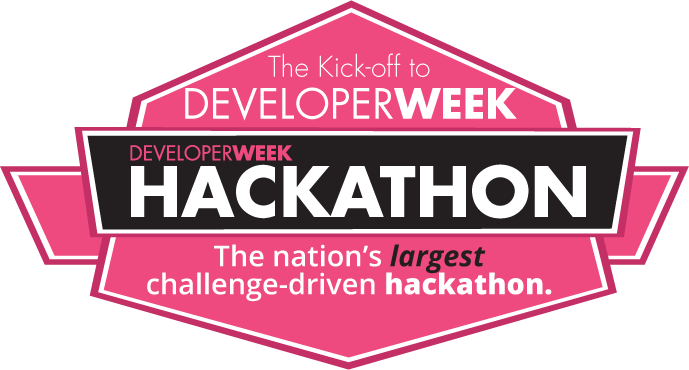 To summarize, it was an amazing experience that we think will strongly benefit to our developer offering. We look forward to meeting you in person in similar events in the future!